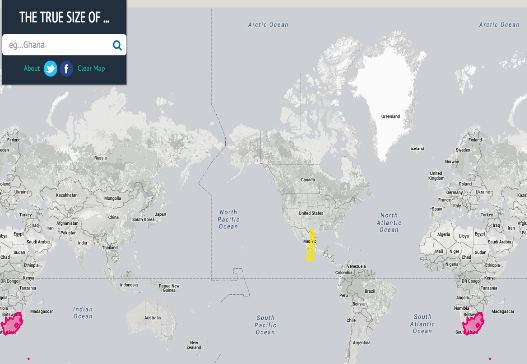 The True Size Of is a new interactive map tool we have recently discovered through Lifehacker. As its name indicates, the app provides users with the real geographical proportions of any region around the globe. As a teacher, you can use The True Size Of with students to enhance their geographical literacy and develop their perception of geography. 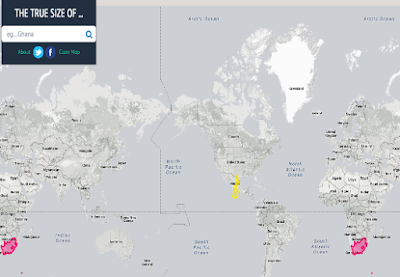 Students can select countries or states and compare their sizes. They can also select a particular area and see how it ‘changes in proportion to the rest of the world’. The True Size Of is web based and does not require any software download. You simply type the name of a region in the search box and the tool automatically highlights the area in the map. Clicking on the highlighted area will show you information about the total size of that region. You can also drag it around to compare it with other regions.